Fatty liver of cultured fish often correlates closely with poor growth and low harvest yield. Some Chinese herbs can reduce hepatic fat storage. This study aimed to examine lipid-lowering effect of berberine (BBR) in blunt snout bream (Megalobrama amblycephala). Triplicate groups of fish were fed four experimental diets: low-fat diet (LFD, 5% fat), high-fat diet (HFD, 15% fat), and HFD supplemented with 50 or 100 mg BBR/kg diet (BBR50, BBR100). After 8-week feeding, growth performance, liver histology and fat deposition, and hepatic genes expression were examined. The results showed significant reduction of growth performance and feed intake in fish fed HFD compared to those fed the LFD and BBR50 diets. Supplementing 50 mg BBR/kg to the HFD significantly improved weight gain and feed intake. Higher hepatic fat content and histological abnormalities were found in the liver of fish receiving HFD, and BBR50 and BBR100 could attenuate these abnormalities of liver. 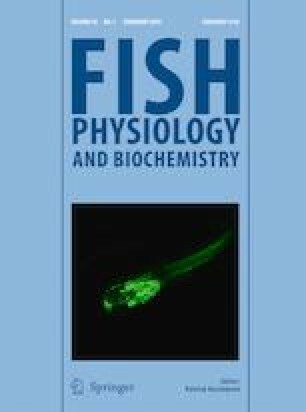 Expression of CPT I, AOX, ApoB100, ApoE, and PGC-1α genes was significantly decreased in fish fed HFD, and 50 and 100 mg/kg BBR supplementation could revert the downregulation of these genes. Also, the expression of FATP, LPL, and LDLR genes was upregulated in HFD-fed fish, and their expression was significantly decreased by 50 and 100 mg/kg BBR supplementation. In conclusion, supplementing BBR to HFD could attenuate liver fat deposition and disorders. The fat-lowering effects of BBR appear to be mediated by activating genes related with fatty acid oxidation and decreasing genes for fatty acid uptake. The online version of this article ( https://doi.org/10.1007/s10695-018-0536-7) contains supplementary material, which is available to authorized users. This work was funded by National Nature Science Foundation of China (31602171), Nature Science Foundation of Fujian Province (2017J05056) and Foundation of Fujian Provincial Education Department (JAT160258).